Soft Discs Add Greater Realism! 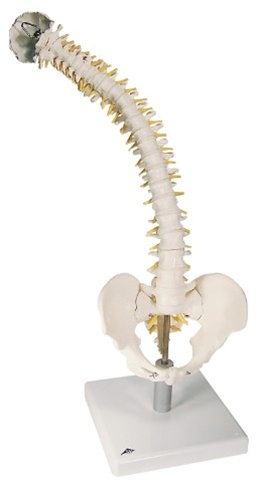 This unique spine shows how the discs deform during normal and abnormal positioning. Use it to demonstrate any number of pathological conditions such as scoliosis, lordosis, kyphosis or subluxations. Herniation can be demonstrated with compression. In addition, the special mounting allows unobstructed viewing during demonstration and display. Includes spinal cord and spinal nerves. Comes with its own, removable stand. I love this spine model. I hope it stand up well over time. It is sturdy and flexible. This model allows me to show how the discs move as the spine moves.